1) Take Apart GBA SP: Firstly you'll need to take apart the console, here is a great video which gives very detailed and clear instructions on how to do this. A few things I'd add to his video is that it is worth being particularly careful when removing the shoulder buttons as they have small springs attached which can go flying across the room if you're not careful! 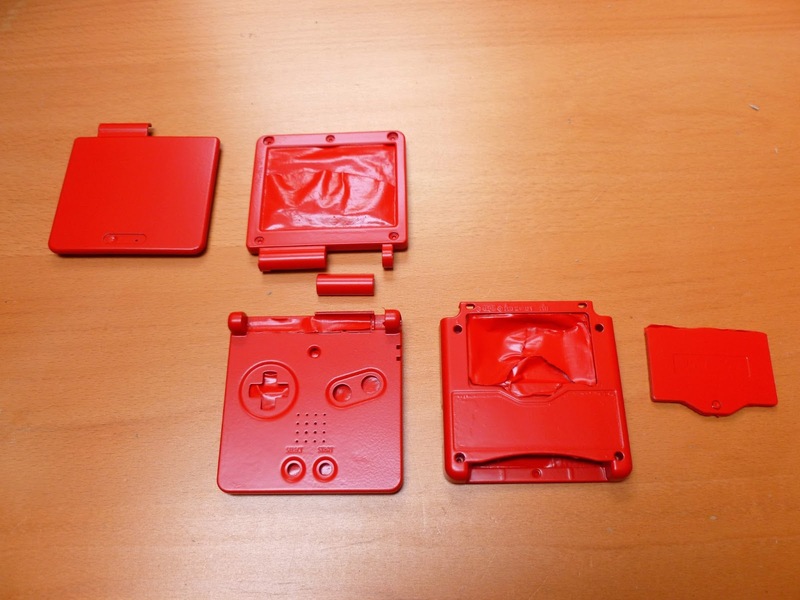 Also, the bottom section has a metal plate attached which he doesn't remove, you'll want to remove this if you plan on painting your GBA. 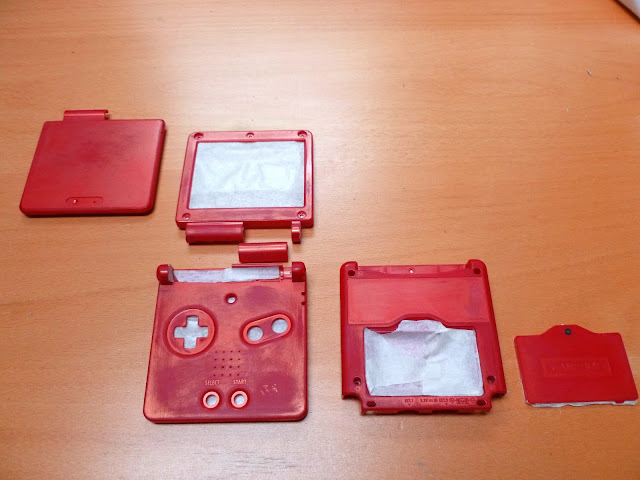 2) Wash All Parts: Once your GBA SP is all taken apart it is worth washing the outer plastic and all the buttons with some regular washing up liquid and an old toothbrush. Give it a good scrub, a rinse and a dry and you'll be amazing by how much better the console will already look. 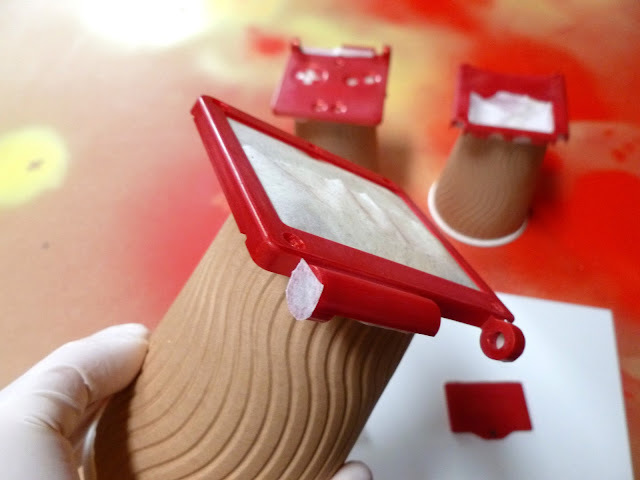 3) Sand Plastic Casing: Gently sand the top layer off the plastic with some fine sandpaper, give it a rinse and a dry. This will allow the sprays to stick better and give a smoother finish. 4) Mask Areas: Next use some masking tape and cover over any parts you don't want paint getting to, it literally gets everywhere otherwise! I basically masked every section that wouldn't be on show when the console was put back together again. 6) Safety: This should always come first, wear a mask, if possible do the spraying outside, if this is not possible do it in an open and well ventilated space. Wear disposable latex gloves, this protects your hands and allows you a bit more freedom when moving and spraying the pieces as you don't have to worry about getting paint on your hands. Wear a mask of some sort, the spray gets everywhere and is toxic. Take breaks if you feel dizzy and make sure you get a breath of fresh air between coats. 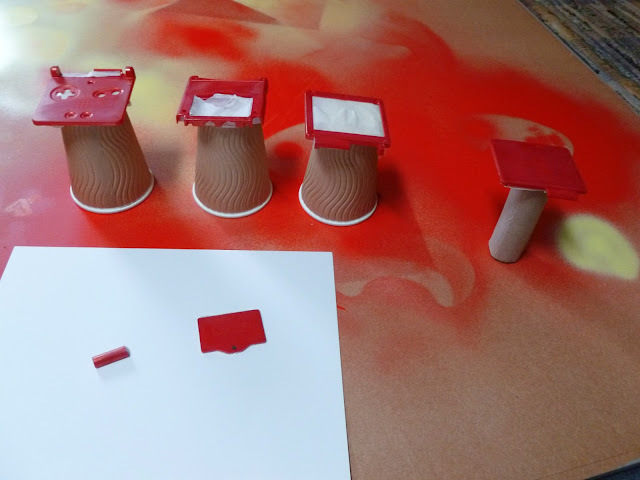 7) What Sprays To Use: There are three stages to the spraying process, primer, colour and varnish. I used Montana Gold sprays... I used the Plastic Primer, Ketchup colour spray paint and a Matte Varnish. These sprays seem to be of a high quality and give a nice coating, they're a little pricey but I'd say it's worth it. What sprays you get is up to you though, some people miss out the priming process and some people use gloss varnishes, it's up to you, one varnish isn't necessarily better than the other. 8) Spraying: Work in thin layers and allow time for drying before applying the next layer. I used one layer of primer, three layers of colour and two layers of varnish. Keep the can moving to avoid drips or build up... oh and make sure to shake the can first! I used a fat spray cap to give a wider and quicker coverage also. The most important thing to remember when spraying is patience, allow a good deal of time between layers and don't spray thick layers. The spray tends to cling to the surface more and more as it dries and any blemishes you see may in fact iron out in the drying process. 9) Removing Masking: Allow the paints to dry completely before carefully removing the masking tape. Sand down any spray build up on the inside of the case that got through the masking tape. 11) Marvel: Marvel at your handiwork! I was hoping to make my casing have a custom design, what type of paint should I use for that without worry of chipping from constant use? Dude, just go for it, if you have doubles then messing up isn't a big deal. Using Paint Sprayer Can ease your work a lot.Then you can experiment more. a bit of orange peel in your paint job, but looks nice. If you want to avoid orange peel I recommend using Lacquer. Lacquer also benefits from allowing you to be able to set sand it to get it crystal clear, super shiny and smooth. Can't do that w/ enamel. Thanks for the tip, will definitely try this out sometime. 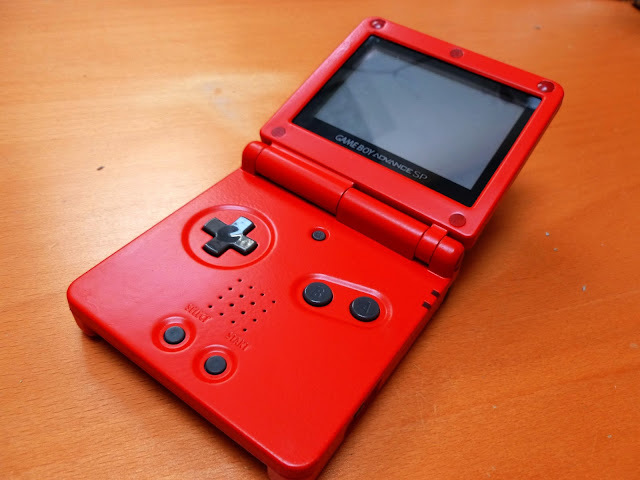 I really enjoyed doing this paint job, perhaps I'll do up a beaten up handheld sometime. Cheers! Please tell me what type of varnish you used. .. 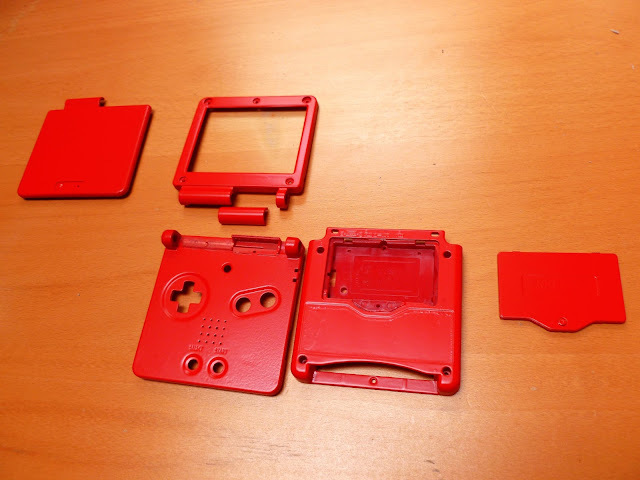 I used mod podge and it completely destroyed the plastic on my gbc, what paint sealers did you use that ended up working well? It's way cheaper to buy a new housing on ebay, the final result of painting a console will never match your expectations. But good luck, I've tried to paint a GBA and I can say it gives you mixed results. I have a used GBA SP with the pearl pink case. Whoever owned it before me did a number on it. Would you recommend a way to remove the paint, but keep the plastic underneath undamaged ? Simplest way is just taking it apart and gently sanding it. Beautifully construted and well organized article. Keep thriving. it is nice content keep improve.